My Memorial Day weekend was filled with bags of clothing and furniture and box cutters. Everyone’s favorite kind of weekend activity : Moving! We didn’t move far but that doesn’t change the fact that we had to move ALL THE THINGS. My poor 8 1/2 month pregnant body was definitely feeling the burn. Fortunately, some friends invited us over for a BBQ on Monday which forced us to take a break from unpacking and relax. This also forced me to come up with my first culinary creation in the new kitchen. A welcome interruption for sure. 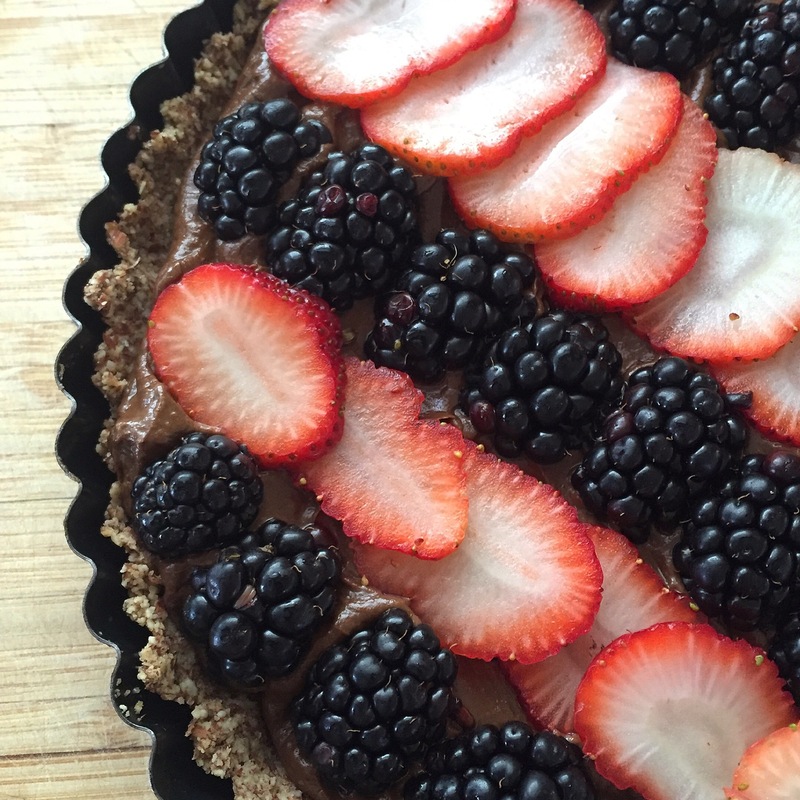 I love using my avocado chocolate pudding as a filling for a tart or pie, and since the holiday weekend typically signifies the beginning of summer, I opted to include some fresh tasty berries! They also lended some patriotic flair in tribute to the holiday’s true purpose; to remember those who have given their lives in service of our great country! The almond meal crust is nutty and wholesome, but if you want a more traditional tart crust, you can swap the almond meal for a fine grain almond flour. Blend all ingredients until smooth in blender or food processor. Combine ingredients in a food processor until moist and begins to clump together. Press evenly into a greased tart pan. Bake for 10-12 mins until golden. Once cool, spread pudding evenly inside crust. Top with sliced berries (I cut the blackberries in half so they would lay nicely #sofancy). Previous Post Pregnancy Week 32: Not Perfect, but Good.